The item 2084 : when God blessed America again!, Rick Chapman, (ebook) represents a specific, individual, material embodiment of a distinct intellectual or artistic creation found in Charlotte Mecklenburg Library. 2084When God Blessed America Again is a gripping story of a man and a woman who grew up under the iron fist of Islamic law in the United States of Islam, formerly known as the United States of America. By sheer force of will and population redistribution, the Islamic faith has now become the controlling force that dominates approximately 80 percent of the worlds populations. James and Gwen, the two main characters, are raised in separate parts of the country. Each suffer through horrible family events brought on by the oppressive society, and each has sworn revenge! By totally separate circumstances, they find themselves in Alaska, one of the few areas of the globe that a person can live in relative freedom. They eventually find each other in the wilderness along with a group of people who also cherish the idea of freedom. 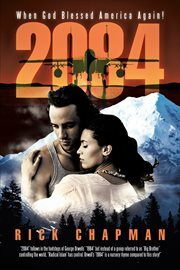 2084 is filled with intrigue, war, and romance. Not a book for the weak of heart! 2084 : when God blessed America again! when God blessed America again!